Russian Buttermilk Pancakes - Оладьи/Блинчики - Let the Baking Begin! If you’re one of those people that makes pancakes only out of the bag, then you’ll be pleasantly surprised at how easy it is to make them. So back to the story with my sister, she called and asked for the recipe, I gave her the list of ingredients and then said that she needs to add enough flour to make the batter thick like a ‘thick sour cream”. Back in Russia, for years people did not have actual measuring cups. 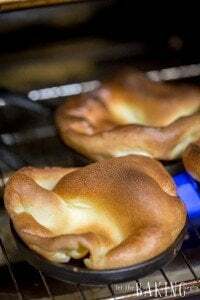 They would say 1 cup, but mean a drinking glass and because those varied in size, the amount of flour you add to the batter was always different, so they would describe the consistency in terms like “thick sour cream” or “thin sour cream”. This in part was because the sour cream was not an item you would buy at the store, but the market instead. Market sour cream was always home made and real, home made sour cream was of pancake batter consistency, that is if it had good percentage of fat in it; but if it had a small percentage of fat, it was very runny and thin, and this is what it meant when they said “thin sour cream consistency”. My sister got the consistency just right, because these came out perfect! I decided to write down the recipe, so that next time she or I want pancakes, we do not need to eyeball it, but can follow the recipe and get consistent results every time. So here it is! 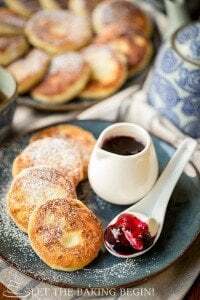 Cottage Cheese Pancake Recipe – Delicious cottage cheese pancakes. Caramel Apple Pie – Creamy caramel apple sauce on warm pancakes. 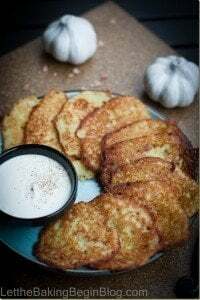 Potato Pancakes – The best savory pancakes. Whisk eggs and sugar together, add buttermilk and flour and mix using a whisk or a mixer until smooth. In a cup mix baking soda and vinegar. Add to the batter and whisk until smooth. 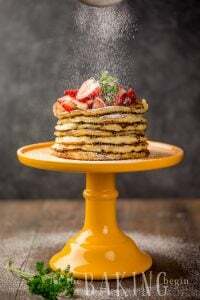 On medium low heat, using a non-stick pan, bake the pancakes using 1-2 tablespoons of oil for every 'round' of pancakes. Using a ladle or a large spoon, pour batter into small rounds. Turn pancakes when bubbles start breaking on the top. Using a whisk or a mixer mix the raspberry and sugar together until the desired "chunkiness" of the raspberry. Serve right away with sour cream mixed with some sugar (to taste) and/or jam of choice. *Using lesser amount of flour the pancakes come out thinner and more "rubber". Using more flour they will be more fluffy and more "americanlike". Over the last few years this has been “the only pancake recipe” I cannot get enough. I modified to 3 cups of flour and 3 tsp of baking powder since I cannot stand baking soda/vinegar combination. Sometimes I use real butter for frying, but most of the time coconut, it fits well with this recipe. As always, thank you for your blog!!!! Hi Galyusha, thank you so much for your feedback :*! 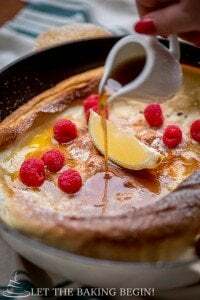 Just because it might be confusing for readers, there IS a significant difference between оладьи (this recipe) and блинчики…blinchiki are more like crepes, very thin, olday are puffy and dense. Thank you for using my recipe Jacob! Marina, this recipe is бесподобное, thank you!